The University of Rochester Film and Media Studies Program is proud to present Laura U. Marks, Dena Wosk University Professor with the School for the Contemporary Arts at Simon Fraser University. Laura U. 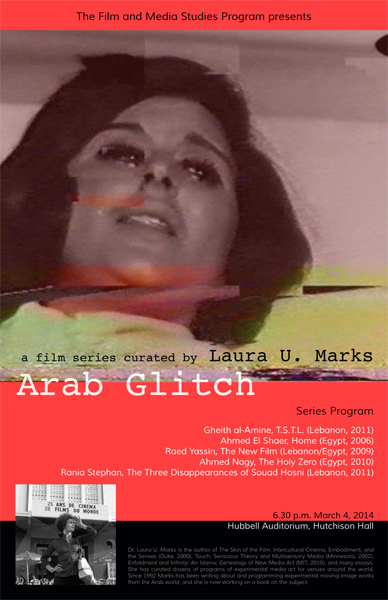 Marks is curating a program of experimental media works from the Arab world that show the physical nature of digital media, which, in many Arab countries, refers to problems with bandwidth, power cuts, and pirated media. Laura U. Marks is the author of The Skin of the Film: Intercultural Cinema, Embodiment, and the Senses (Duke, 2000), Touch: Sensuous Theory and Multisensory Media (Minnesota, 2002), Enfoldment and Infinity: An Islamic Genealogy of New Media Art (MIT, 2010), and many essays. She has curated dozens of programs of experimental media art for venues around the world. Since 1992 Marks has been writing about and programming experimental moving-image works from the Arab world, and she is now working on a book on the subject. The screening will be followed by a talk.